The constant domain of the antibody light chain (CL) is essential for both folding of the heavy chain CH1 domain and consequently also for quality control of correct antibody assembly. Since the CH1 domain can only adopt its native conformation after association with the CL domain, alterations in CL may have an impact on the efficiency of assembly and secretion of antibodies. The present invention improves the biophysical properties of antibodies and results in a strongly increased secretion. Following the stabilizing structural elements of shark antibodies, the CL domain is modified by an conservative exchange of amino acids at two positions. This leads to the formation of an internal salt bridge and an extended hydrophobic core. Compared to the wild type CL, the meltingpoint of the modified CL domain is almost 10°C higher and its stability against urea-induced denaturation is also markedly increased (see Figure below). Notably, when light chains comprising this optimized CL domain were co-expressed with Ig heavy chains, a significant increase in the assembly and subsequent secretion of complete IgG antibody mo- lecules from mammalian cells was observed. Although this technology was established using IgG, it is applicable to all classes of antibodies because of the ubiquitous presence of CL in all immunoglobulin classes. Furthermore, this invention will also be applicable for the optimization of other constant do- mains besides CL. Figure: A: Thermal stability of the human wild type κ CL domain (grey) in comparison to the optimized mutant (black). 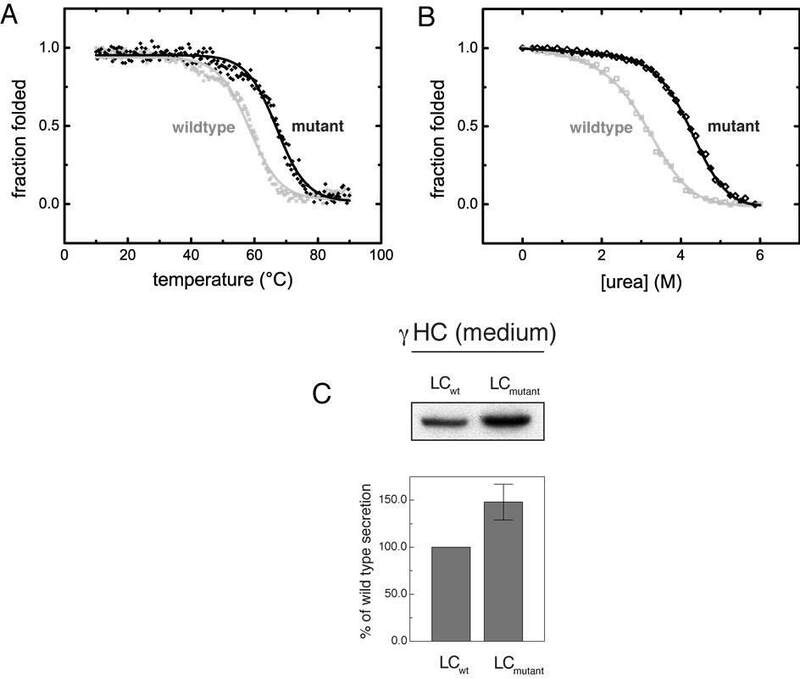 The mutant’s melting point is almost 10°C higher; B: Chemical stability against urea of the human wild type κ CL domain (grey) in comparison to the optimized mutant (black); C: Influence of the optimized CL domain in the context of a human light chain (LCmutant) on the secretion of human γ heavy chains from COS cells (increase by approx. 50%).